Through the night the rain poured and the wind howled, but come the morning of Thameside 1, skies were blue and the sun shone. Thankfully, as it just took the edge off freezing temperatures. 50 K1s and 65 K2s took to the Kennet Canal over the next two hours and raced the 12 miles and 12 portages (or 14 if you didn’t squeeze under the low bridges) back to Reading Canoe Club. We were very lucky with the racing conditions – the aforementioned sunshine, plus a handy tail wind which only occasionally became a cross wind! That was until the Thames. Upstream against 40mph winds was not pleasant even for the hardiest crews. Great organisation from Dan S and his team. It all worked like clockwork. There were a handful of Reading crews among the entries, most notably Nigel with Annabel/Bruno (half and half) and Tant Hill with son Sam, who came 2nd and 3rd respectively in Junior Vets, Jim who came 2nd in K2 mixed, and Alex Tonkin and Sam Betts who came 5th and 8th in a tough field of Junior Men K1. Please note this Saturday see the Reading University Head of the River race, there will be river closure in place between 10:00 to 12:00 and 14:30 to 16:30. The rowing club have also booked the club room. 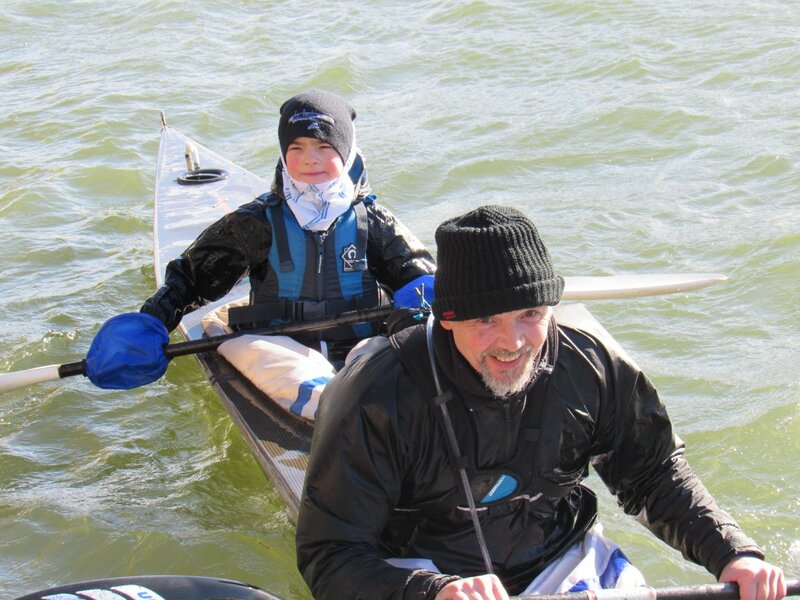 Some excellent photos from Thameside 1. If you have taken photo and want to share, please email us a link to your album. 1) After considerable representation made by race organisers and officials over illegibility of numbers, particularly on finishes, the MRC have made a rule change for this year, to insist on using insulating tape for numbers on our existing boards. A quick look at a few of the photos available in various places online illustrates why. I thought my number boards were fairly clear as I take care over making them, but compared with even rather untidy tape numbers they are quite faint and on sunny days much less legible. We were one of the clubs where results were delayed and we thought a paddler was missing last year, because of a badly made number in pen on a grubby board misread at the finish. (I personally examined the board as it was one of our own paddlers.) Once tape numbers are made, they can easily be remade over and over again using the same tape. 2) Promotion of more than one division will mean no points towards Hasler scores at either regional races or Finals. The need for this has become clearer as some clubs are still not ranking their paddlers accurately, either by choice or lack of experience. I would like to hope that it’s the latter. It was illustrated on this year’s Frank Luzmore where some paddlers rankings were clearly shown well below their real ability including national squad paddlers (who may not often enter regional races.) For clubs that have difficulty in ranking their paddlers, there is a copy of the system that the National Ranking Officer uses on the website. For those who find the calculations tedious, it uses the HC values from page D1 of the handbook. This is very similar to the spreadsheet I use and probably slightly more obvious on how to use it. Also need to mention the BCU courses for event safety which all organisers will hopefully have attended before their race. As it stands, the Thames will be on red boards for this Sunday’s event. This requires additional safety measures to be introduced. At a minimum the following rules will be enforced FOR ALL paddlers, this could be increased further if required. The Self Assessment form gauges your likely ability to complete the race in the conditions forecasted. Final Course inspection is taking place on Friday, at which point the course score will also be published. Using the course score and your self assessment score should give you a good guide on whether you are able to take part. 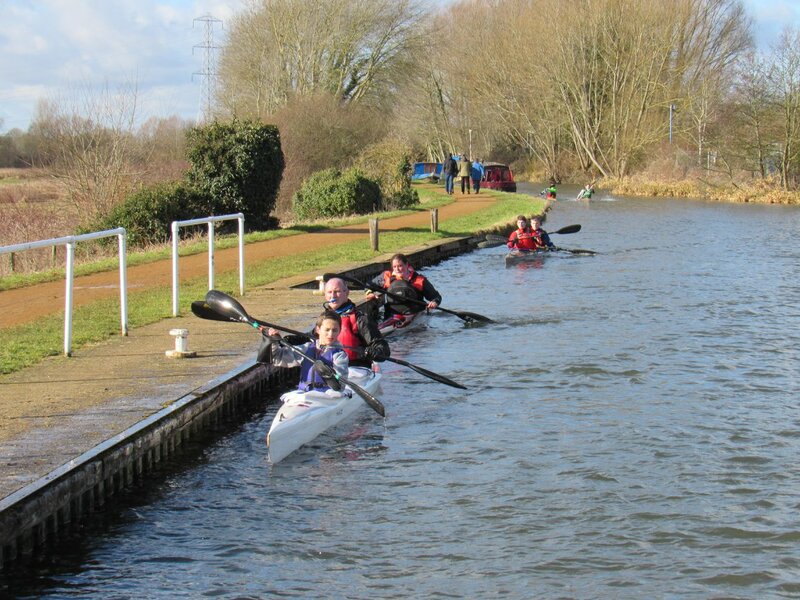 Thanks to all those who supported the Thameside 1 event today, both on and off the water. The course is a most for any DW paddlers to practice. The low bridges and tricky locks did not take too many victims. All bar one of the 136 boats that attended the race today completed the course. Fastest boat went to Lizzie Broughton and Keith Moule in a time of 1 hour 22 minutes. Which is possibly a course record, will need to check the historic results. 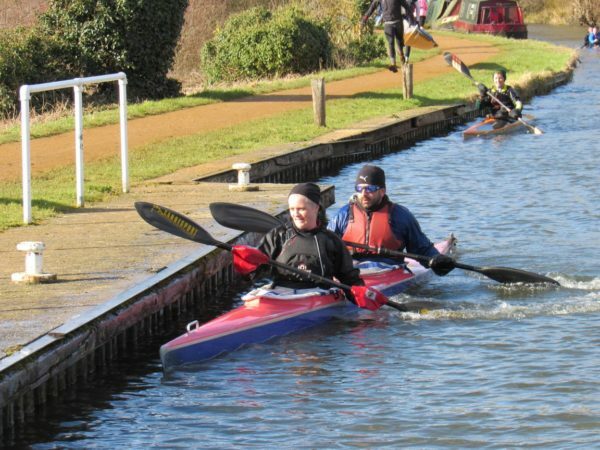 Thameside 2 – Reading to Marlow is on 1-March, another must for DW paddlers. Online entry system will open shortly. Entry to this year’s Thameside 1 is very high, this will put pressure on both start and finish sites. Therefore, where possible, please car share and remember to always park legally and considerately. This is very important to future of this event. Please use Albert Road, which is short walk from the club. Please see map for directions. Everyone racing is required to present their BCU card at check-in or pay for day ticket. Waterside A marks the start of the build up races to the Devizes to Westminster race (DW), now just a little over a week away. Start sheets and start window charts have been published. It can’t be stressed enough how important it is to stick to the time table. These measures are required to manage the impact on the local community, which is key to ensure the future of this event. Clubs and groups with large entries should car share as much as possible, every car counts! Entries for the Thamesides is now open, please check race details and enter here! Club Sport personality of the Year! Check out our very own Sam Kirschstein picking up the Junior Male Sports Personality of the Year. New Bridge – Tow Path Closure! Construction of the new bridge across the Thames at Reading (just below De Montfort House) is in progress, there will be some tow path closures. So keep a look out. Check out some artistic images.